….. a few days after the summer solstice. West Ward Works, in Dundee, previously used for printing books and magazines, was the site of the first Dundee Design Festival, 25-28 May 2016. The Works is now a disused factory, vast space, tubes, wiring and old instructions on the walls. The Works was one of those many places in Dundee and its surrounds that processed masses of natural product – flax and jute are other examples – usually extracted or grown elsewhere, but given greater value through manufacture and sale. 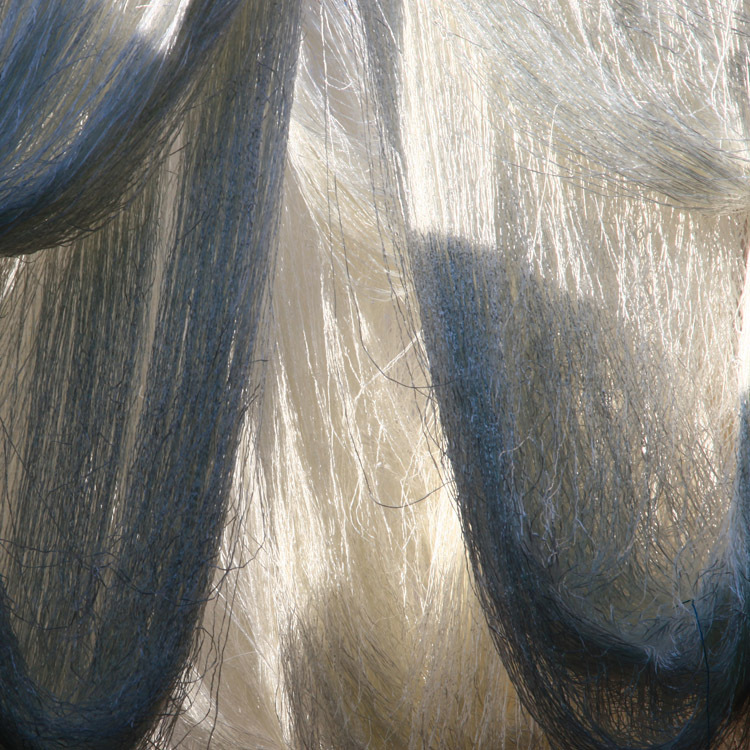 Several of the exhibits used natural fibre or other natural products. 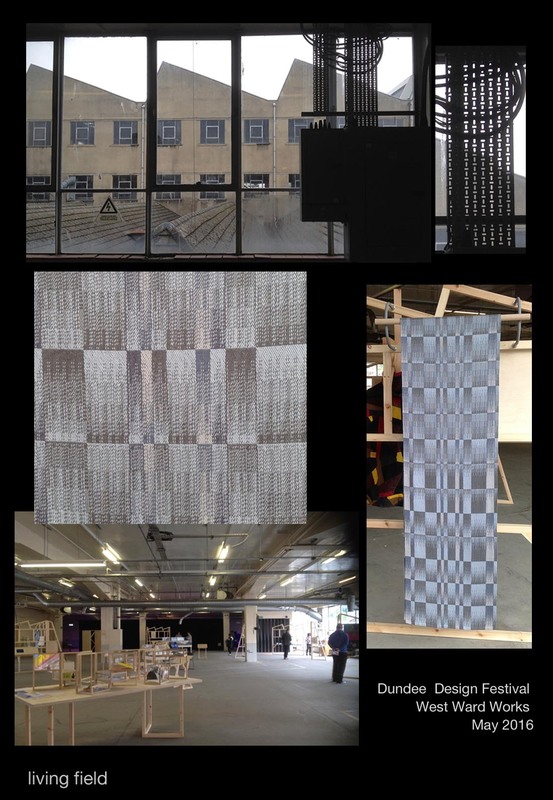 ‘Firth of Tay’ (shown among the images above) is a length of handwoven silk by Cally Booker. The notes say ‘Each block of pattern corresponds to (the) population profile in a local city, village or town’. It looks as if the patterns are based on a set of statistical distributions, e.g. perhaps number of people by age. (The subtlety of the colours is not well reproduced in the cellphone snaps above – her web site shows the original, link below). Elsewhere, Barley waste from local brewing has been compressed and formed into a piece of furniture (a bar) by Beer52 with Design in Action and Aymeric Renoud. Exhibitors referred to above: Cally Booker, Aymeric Renoud, Scot & Fyfe. On this site: Living Field web pages on Fibres, and Fiberoptic 1, 2 , 3 and 4. The High Mill, derelict for some decades, has been restored at Verdant Works and is open to the public as part of the Verdant Works Museum, Dundee. 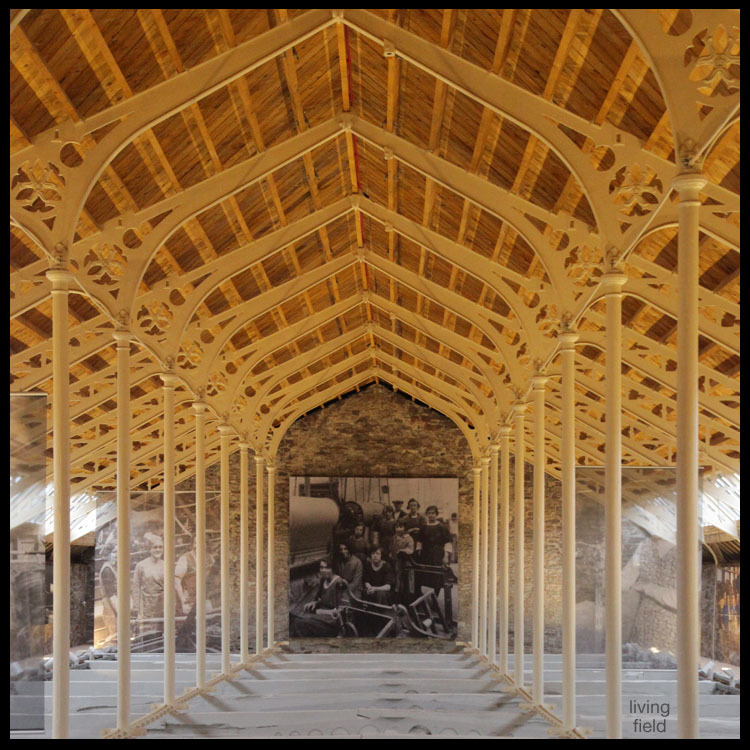 This magnificent restoration reveals the skills in engineering, architecture and construction that arose with the industrial revolution. The restored ironwork is a superb sight while the roof timbers reflect the colour of jute fibre. See for yourself. The name Verdant arises from the flax fields that used to grow in the area of the Mill, yet the flax disappeared many years ago. The museum tells of the changes in the textile industry from its beginning as a distributed home-based craft, cultivating flax and making yarn and linen cloth. Local cultivation gave way to imported raw material. Then local production gave way to steam power and to industrial manufacture. Even this was out-competed in the 1800s as the industry turned to jute grown in India and Bangladesh. The main museum presents the story of jute. 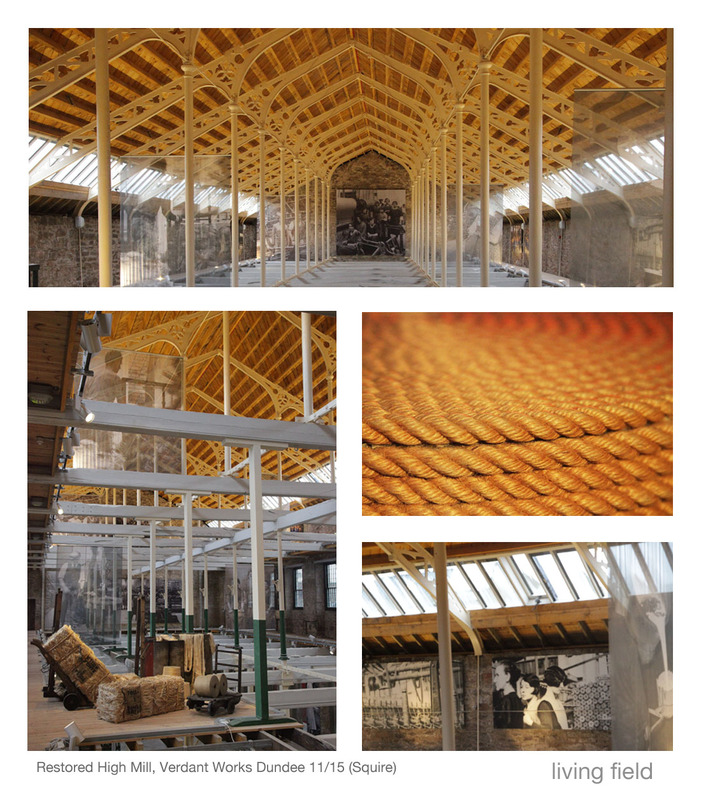 The spaces created at High Mill are intended for exhibitions and education …. but they make you wonder, both at the engineering skills that created the building and the industry it served, and the often appalling conditions and treatment of the people who worked there. 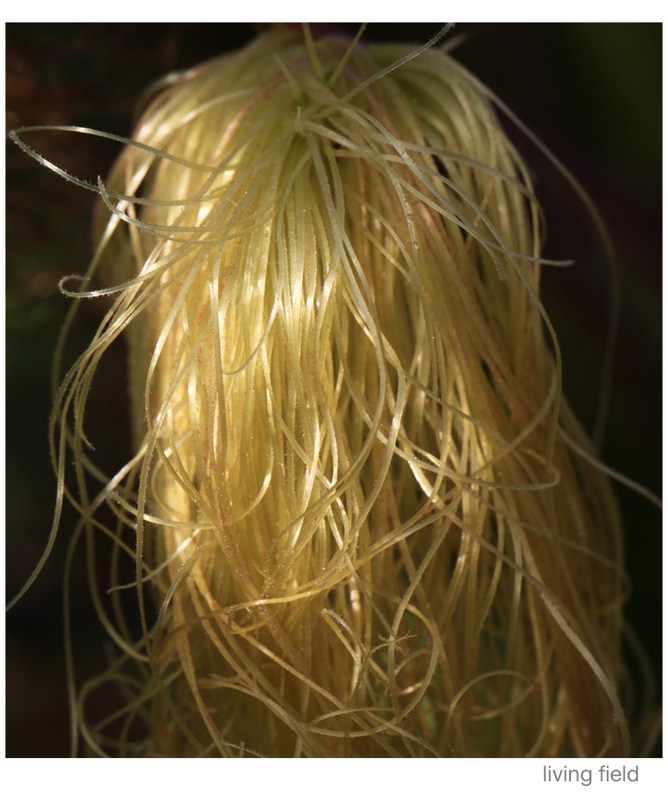 The Living Field’s web pages on Fibres, part of the 5000 Years – Plants project – describe local and global production of fibre plants, including flax and jute. 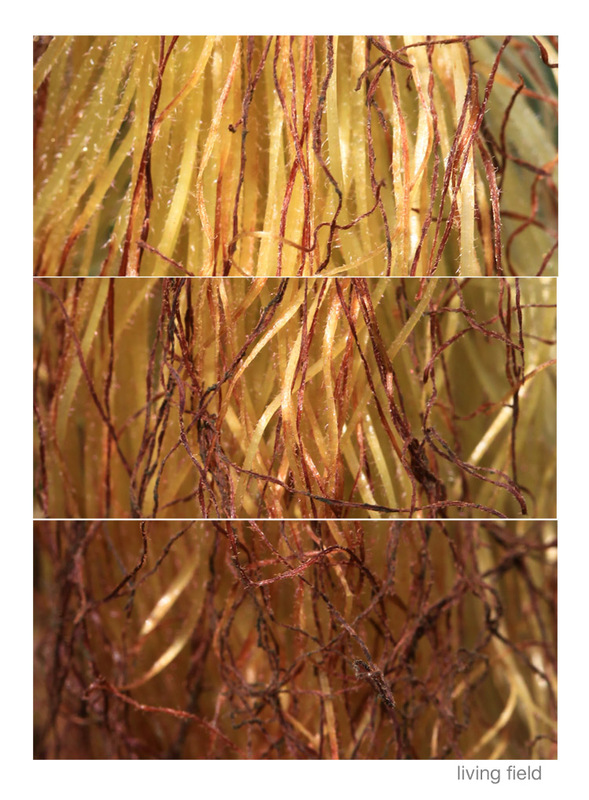 Sections down a single maize silk, the upper one just below the exit from the forming cob: each strand, less than 1 mm wide, leads to a seed site deep in the cob, 23 September 2015, Living Field garden (Living Field collection). See also: Fiberoptic 3, Fiberoptic 2 and Fiberoptic. As if to presage our various web-entries on natural fibres, oils, medicinals and culinary spices, the notes below, from the Advertiser, of 1 May 1840, reproduced in the book ‘The Trade and Shipping of Dundee 1780-1850 by Jackson & Kinnear , confirm Dundee’s desire to trade globally in natural products in the mid-1800s. The time (1840) was transitional for Dundee and its hinterland. It was at the beginning of a phase of international trade that gave the area status as a port and manufacturing centre. Jackson & Kinnear relate that the barque Selma arrived on that day from Calcutta … the first with cargo directly for Dundee. Selma contained, among other things, over 1000 bales of jute, many sacks of unseed  and linseed, 300 bags of sugar, more than 1100 bags of rice, coir fibre from coconut and almost 2000 whole coconuts, and teak planks and bamboo; also buffalo horns; spices and condiments – preserved and dry ginger, canisters of arrowroot, tea, black pepper, cloves, nutmegs, mustard seed, castor oil, chillies and cubebs ; hogsheads of wine; and then borax and camphor; samples of hemp Cannabis sativa, presumably for fibre. This is an amazingly varied cargo of plant, animal and mineral goods coming into Dundee, on one ship, 175 years ago. Many items in the Selma’s cargo are still in common usage today, but others may be less familiar. Are you kitchen-cupboard-ready? Arrowroot a starch from tuberous parts of the roots of some tropical species, e.g. cassava Manihot esculenta, used as a thickening agent in cooking and to make arrowroot biscuits – biscuits your granny gave you, proper, decent, thin, no chocolate, no sugar, could be dunked in tea without falling to bits and dropping in – just biscuits. Castor oil (beavers love it) from the castor-oil plant Ricinus communis, among other things, used as a laxative: pinch the nose, open the mouth and in with the spoon! Castor oil has many legitimate medicinal and industrial uses, but its laxative, and thereby dehydrative, properties have been used as a means of systematic punishment and torture . The seed-oil is extracted by complex methods; the seeds also contain the highly poisonous ricin. Borax (not a superhero but) a white crystalline substance made from a salty deposit when lakes in some parts of the world such as Tibet evaporate. Borax is used as a mild disinfectant and cleaner. It was put on children and other humans to cure infections like athlete’s foot and dabbed on mouth ulcers (it stings!). Camphor. A strongly aromatic extract from some tropical trees, also found in the plant rosemary. Went into mothballs, made old drawers smell funny. Camphorated oil got rubbed onto childrens’ skin to do it good. Cubebs from Piper cubeba a bit like black pepper corns but with a short stalk (‘pepper with a tail’), mainly grown in Indonesia, and traded for many centuries in that region; employed as an aphrodisiac in Goa as reported by the traveller Linschoten in the 1580s (Q: how did these explorers and ethnobotanists get to know such things – did they experiment? ), stimulant and antiseptic, and a tonic for ‘every disease that flesh is heir to’  ….. and much more. The question you have to ask is what Dundee folk were up to in those days 175 years ago, at least those few that could afford all these exotic imports. Hemp, cubebs, cloves, hogsheads of wine … the ingredients of wild days and nights, and then they came down to earth with borax, camphor, castor oil and coir shirts. And what about the buffalo horns – what were they used for? Jackson G, Kinnear K. 1991 The trade and shipping of Dundee 1780-1850. Publication 31, Abertay Historical Society, Dundee. Scanned 2010 and available online http://www.abertay.org.uk. The list of commodities carried on the Selma is given at page 20 and Ch 3 note 32. Unseed – this had the Living Field in a stir. Even Burkhill’s 2400 pages did not list it [see note 3]. But thanks to an online note found from an internet entity named ‘cyberpedant’, we are reassured that the original was likely ‘Linseed’ and that when documents are scanned, the shape ‘Li’ is commonly read as ‘U’. Relief! Otherwise we’d be scanning the world for unseed seed and never finding it. Cubebs. Notes above taken from Burkhill IH, 1966, A Dictionary of the economic products of the Malay Peninsular. Ministry of Agriculture and Cooperatives, Malaysia (2400+ pages). On the aforesaid properties, Burkhill cites Jan Huyghen van Linschoten’s Historical Voyages, published in English 1610. Castor oil. The author Umberto Eco, in the Mysterious Flame of Queen Loanna (2004), relates in Ch 12 a story of a journalist in fascist Italy being forced to swallow a bottle of castor oil as punishment. But after the first two purgings, he regained enough presence of body and mind to bottle and seal the next expulsion of oil and faeces. The bottled contents, sealed from the atmosphere, were kept in hope that the fascist tide would turn, and when it did, the means were found to trace the original perpetrator and pour the 21-year-old vintage down his throat. A delicious passage! Of the photos taken at the Commonwealth Games fabulous opening night in 2014, the one icon of note missing from the collection was the Tunnock’s Teacake, the giant red and silver teacake replicas on legs, cavorting around the arena … not a single photo turned out. That’s why we added the nearest thing – the marsh mallow. This plant was the source of marshmallow, the sticky confection used in cakes and now mostly replaced by other sweet sticky stuff, still called marshmallow. Yet it’s the hairy relatives of the marsh mallow that are more widely cultivated. The marsh mallow Althea officinalis is a plant that lives in marshes and is one of the mallow family – that is why it came to be known as marsh mallow – but it also be grown in gardens and the Living Field has a few individuals in its Medicinals collection. The name officinalis indicates its use by the apothecary, in this case as a poultice, something to put on wounds. The plant has a darkness about it, the not-quite-white flowers never without a purplish tinge spreading up from the base, but its value to people over the ages is unquestioned. This mallow family has many other useful plants in it, notably two that are valuable because of their fibres. 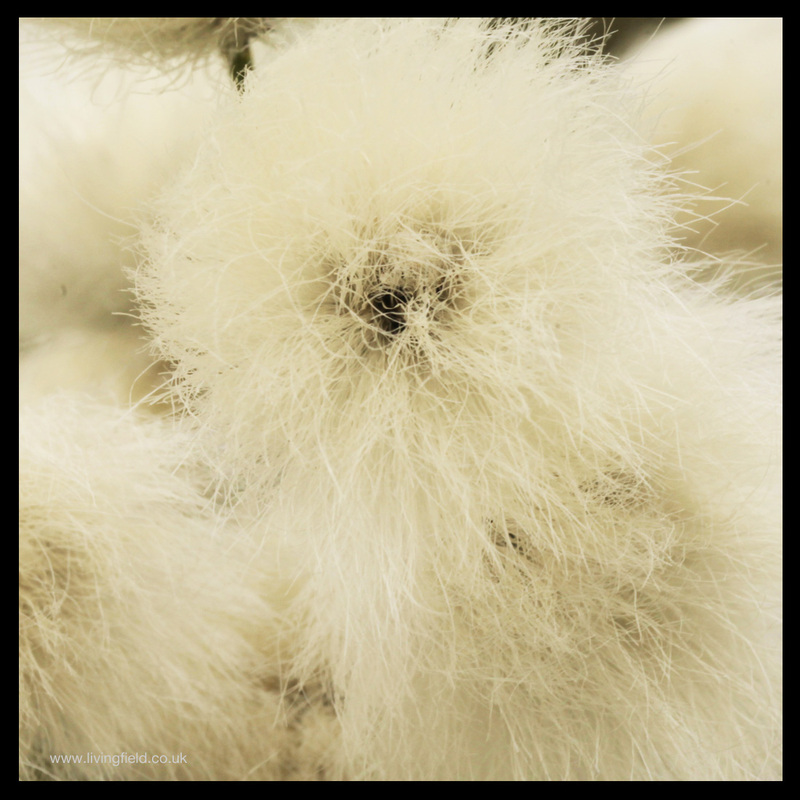 Cotton and kapok are from warm countries and, unusual among the fibre plants, produce the fibrous material around their seeds, whereas most commercial fibre plants produce it in their stems. Cotton is now grown worldwide, over more area than any other fibre crop. Kapok is less familiar – the fibres used to be stuffed in pillows and furniture – but most kapok now sold is artificial, not made from the plant, but still called kapok. The flowers of these plants are similar, the parts arranged in ‘fives’. (The specific name of kapok is Ceiba pentandra). But plants of the mallow family differ in many other aspects. Mallows in Britain are small or large perennial herbs, the marsh mallow reaching one and half to two metres; cotton can reach two to three metres; but the kapok is a big tree. 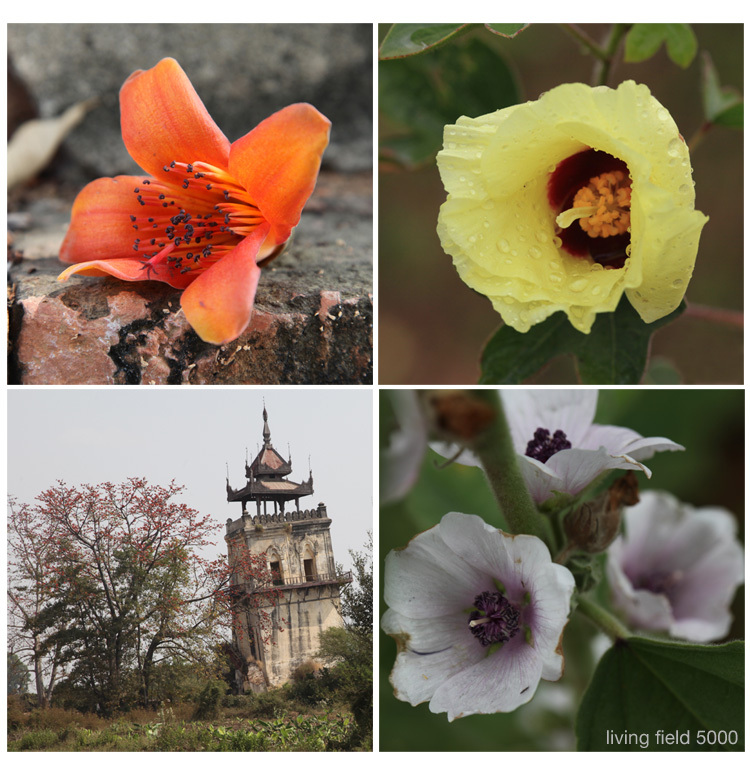 An example is shown at the lower left of the images above, the red flowers colouring the outer branches of the tree, this one near Mandalay in Burma. 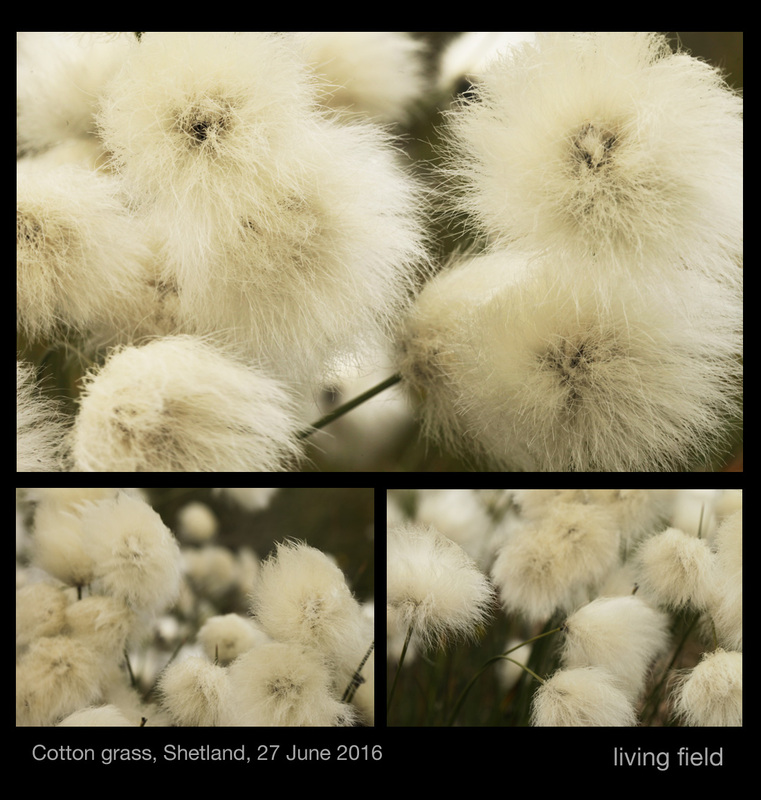 There is more on cotton and kapok on the living Field’s new Fibres pages, part of the 5000 years project. Plant fibres before dying, Souk des Teinturiers, Marrakesh (Squire/Living Field). See also Fiberoptic and Fiberoptic 2, 4 and 5.